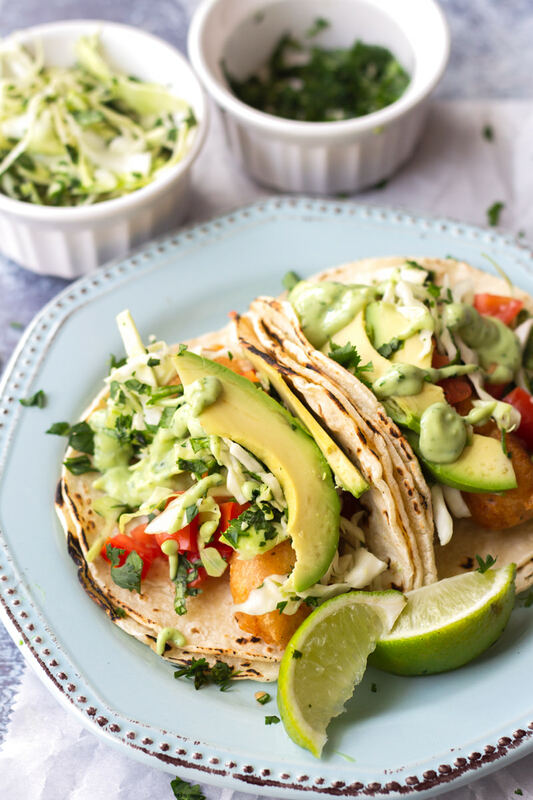 These crispy Baja Fish Tacos are perfect to share at the table! Crunchy, moist, tender fish with a refreshing green cabbage slaw and a delightful avocado crema. 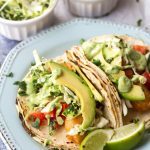 Make these delicious Baja style fish tacos tonight! What’s not to love about Baja fish tacos? I like to cook the fish with a beer batter because it gives the fish a nice crunch and extra flavor. The beer batter also makes the fish tender and moist. 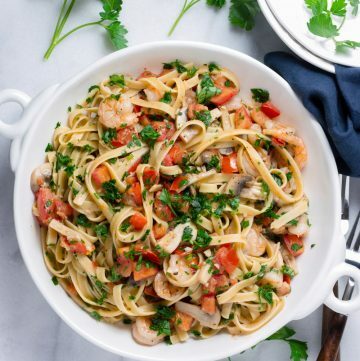 The toppings – cabbage slaw, tomatoes, cilantro, avocado – balance out the overall dish. 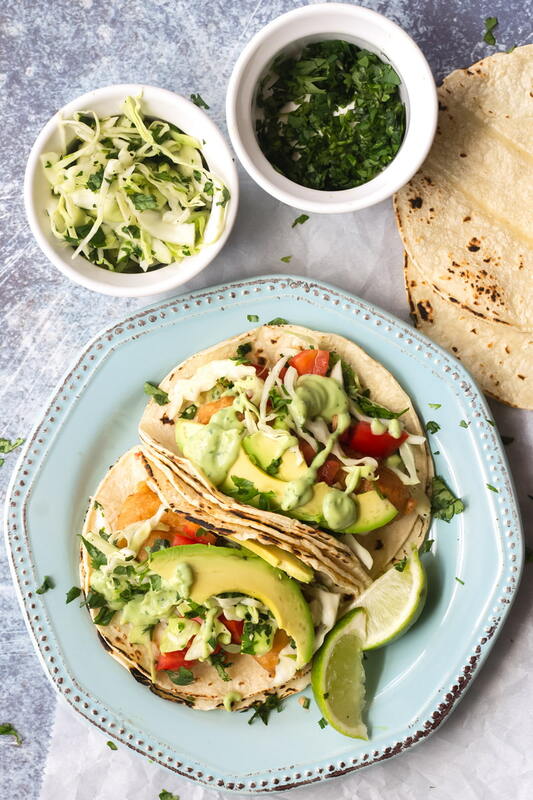 Oh, and the avocado crema is the perfect way to tie up all the components in this Baja style fish taco recipe. The best! To me, a good taco has to be super flavorful, bold, and well-balanced. I can’t tell you how many disappointing bland tacos I’ve had in my life – they are a big no-no! Here’s the thing, if you can pretty much only have 3 bites out of a taco, then the flavors HAVE to be there. And this is exactly what I aimed to accomplish in these fish tacos! 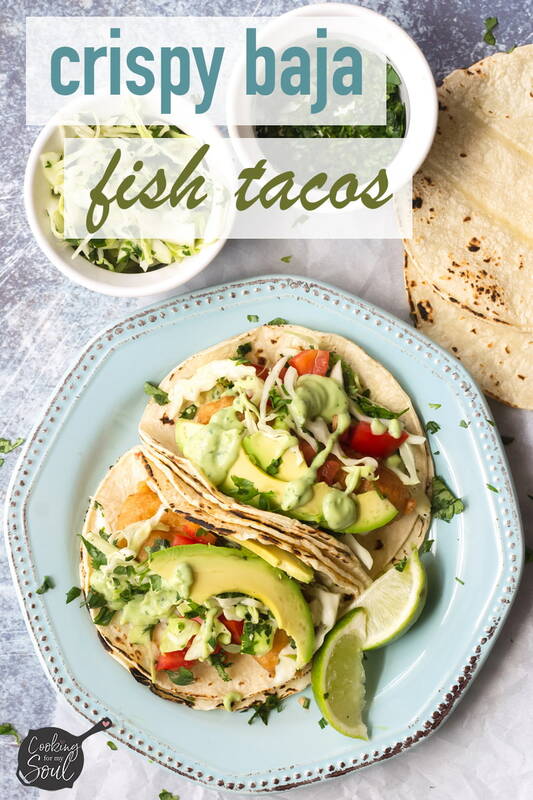 So if you’re sold, let’s go over how to make this Baja fish tacos recipe! Deep frying protein in hot oil exposes it to very high temperatures, which is why I recommend using some type of batter. Batters protect the meat from becoming too tough and from drying up, and also adds crunchiness from the air pockets that form during the frying process. Beer, in particular, provides extra airiness from the carbonation, which creates a light batter for the fish, as opposed to a thick crispy chicken batter. Generally, beer batters are a mix of flour, beer, and spices. This combination creates a thick batter that allows the fish to cook gently. 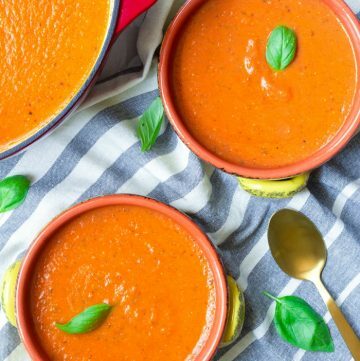 Plus, it adds yummy flavors to each bite. 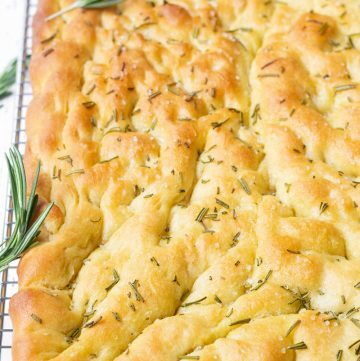 Not gonna lie, this is not a super simple or easy recipe. 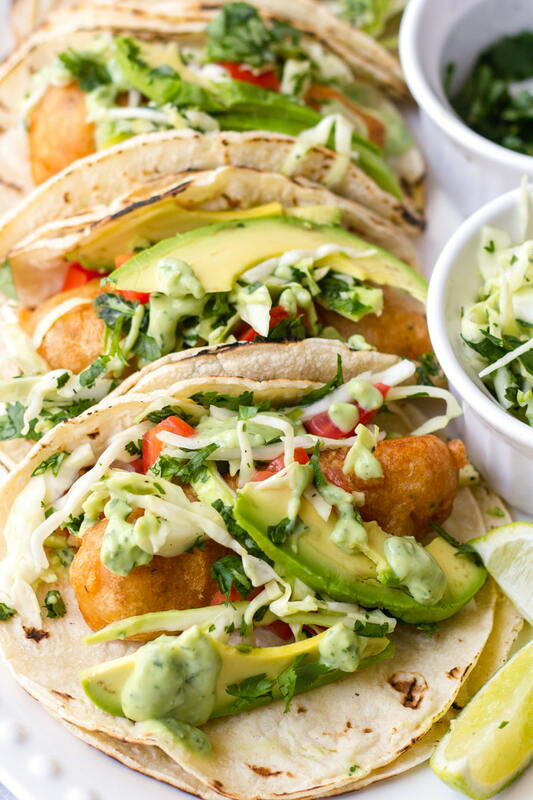 Making this Baja fish taco recipe involves a few steps and deep frying. 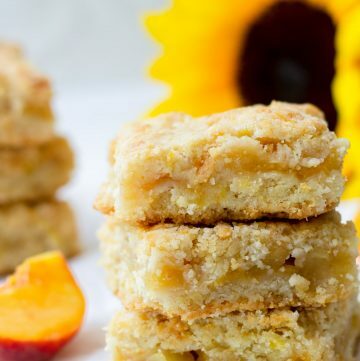 However, if the kitchen is your happy place, this recipe very fun to make! Prepare your toppings ahead of time. Prepare the batter: mix the flour, salt, pepper, garlic powder, and cayenne pepper in a large bowl. Then, gradually add the beer, whisking until no lumps form. Let the batter rest for 15 minutes. Heat vegetable or canola oil in a 3 qt Dutch oven to cover about 2 inches of the pot. Get the oil up to 350 degrees F. Use a candy thermometer to check the temperature. Season fish with salt and pepper. Dredge in the some flour, shaking off any excess. Then dip in the prepared beer batter. Deep fry in the hot oil (350 degrees) for about 5 minutes or until golden brown and cooked through, turning once or twice. Work in batches. Transfer to a plate with a paper towel to absorb any excess oil. Heat tortillas in open flame, if you can. If not, you can heat them up in the microwave (place damp paper towels between each tortilla) or on a skillet. Assemble the tacos: on top of 2 warm tortillas, place 1 piece of fish and add toppings. 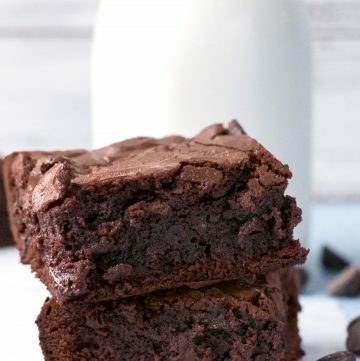 Drizzle with avocado crema. And that’s how you make these amazing Baja style fish tacos! I swear every bite is ultra delicious and satisfying. What Fish Should I Use in these Tacos? For these Baja fish tacos, any type of white fish that will hold its shape when cooking is fine. I used cod for this recipe, but I’d also recommend mahi mahi, halibut, or grouper. I love to serve my fish tacos with some type of refreshing sauce that cuts through the deep fried fish. 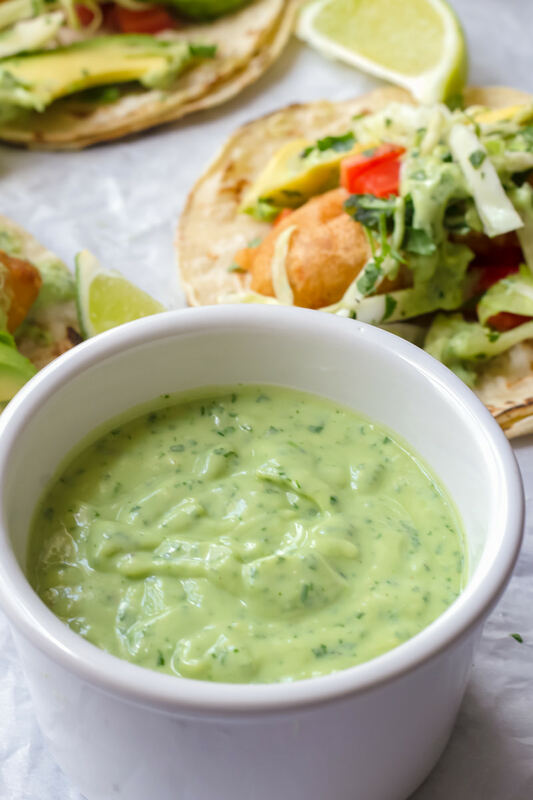 My favorite Baja fish taco sauce is this avocado crema. It’s creamy and vibrant, made with avocado, lime juice, garlic, cilantro, and Greek Yogurt. It’s the perfect addition to tie all the fish taco flavors together! Great toppings make a good taco a superb taco! For my crispy Baja fish tacos, I made a simple green cabbage slaw to go with diced tomatoes, chopped cilantro, and avocado slices. And to tie all the flavors together, I made a delicious avocado crema. 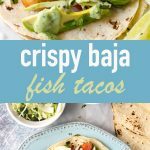 Check out the recipe below for instructions on how to assemble these delicious crispy Baja fish tacos! Heat the tortillas in open flame if you can. 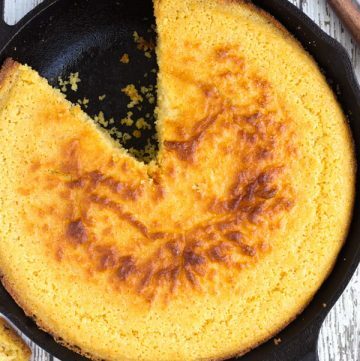 If you don’t have a gas stove, you can heat them up on a skillet to brown it a little. If you prefer to use the microwave, wrap 3-5 tortillas at a time in damp paper towel and microwave for 30 seconds or so. You can also use the oven (wrap in foil). Doubling up the tortillas helps to hold everything together. Use a candy thermometer for measure the temperature of the oil. 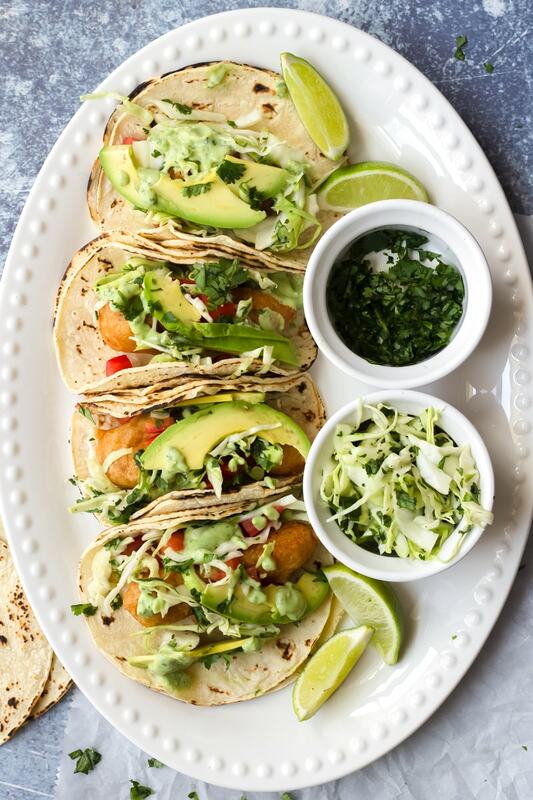 These Crispy Baja Fish Tacos are the perfect dish to share at the table. 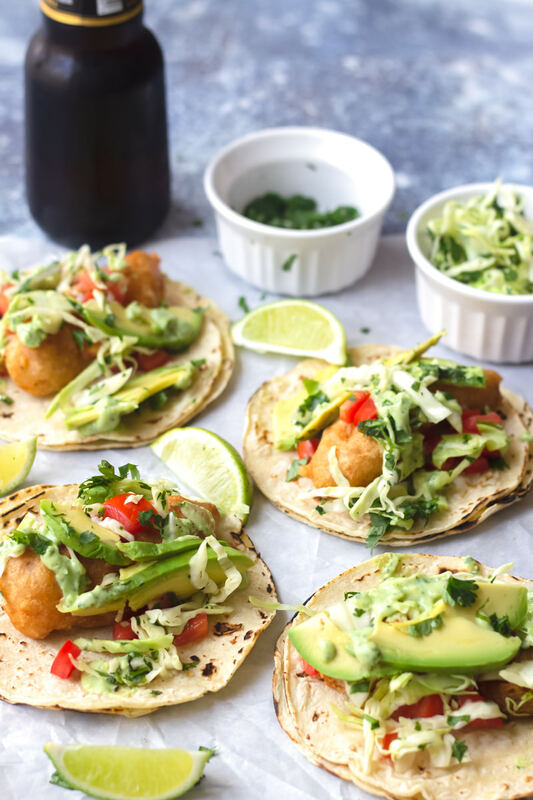 The beer batter helps to keep the fish moist and tender, and the toppings and avocado crema all work together to make a delicious taco! Make the avocado crema per link's instructions. Place in the fridge until ready to use. Make the batter: mix the flour, salt, pepper, garlic powder, and cayenne pepper in a large bowl. Gradually whisk in the beer, until no lumps are formed. Let rest for 15 minutes. 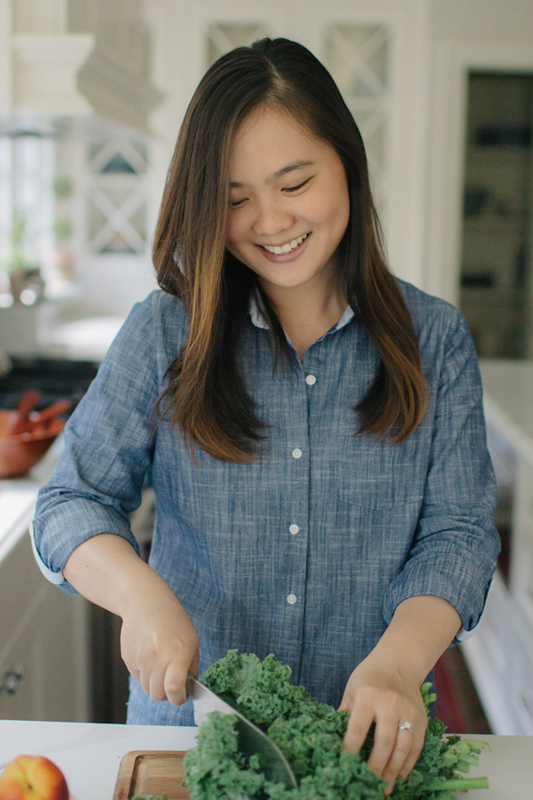 Meanwhile, make the green cabbage slaw: toss shredded green cabbage, lime juice, cilantro, salt, and pepper. Set aside. Heat oil in a 3 quart Dutch oven to cover about 2 inches of the pot. Using a candy thermometer, heat oil to 350 degrees F.
Season fish with salt and pepper. Dredge fish in flour, shaking off any excess flour. Working in batches, dip each piece of fish into the beer batter. Deep-fry in the hot oil (350 degrees F) for about 5 minutes, or until golden brown and cooked through, turning occasionally. Transfer to a plate lined with paper towel to drain excess oil. To assemble the tacos: Heat tortillas on open flame or microwave (see notes under Kitchen Tips). Double-up each tortilla. Place fish on tortillas. Top with the green cabbage slaw, tomatoes, cilantro, avocado slices. Drizzle with the avocado crema. Serve immediately. Serve with lime wedges.